Termite management is a method of getting the termites out of your home and preventing them from causing further damage. 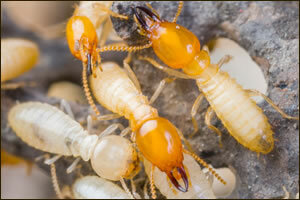 Most professional termite professionals will use one of two methods for exterminating termites. They will use either liquid termiticides or baiting. They may also use a combination of both methods. Termiticides are generally applied to the soil and will act as a barrier to the termites. There are both repellent and non-repellent termiticides. Both are used to prevent the termite from being able to return to your home. Bait repellent stations or Bait monitoring stations are the second method used in termite management. Bait stations are made up of paper or cardboard that is treated with a substance that is lethal to the termites. this treated substance is placed in stations underground around the home. The bait is taken back to the nest by the termites and will eradicate the nests. Spot management is generally not the best method of exterminating termites. By only treating the home in specific spots, you may not be able to eliminate the termites. The best method of termite management is to treat the entire home or business. If you feel that you are in need of termite exterminating and termite management, call of of our experts today and set up a termite inspection.